Since I have an interview scheduled tomorrow, I have been finding ways to rehearse my presentation. The best way I can prepare is to basically write it down first. 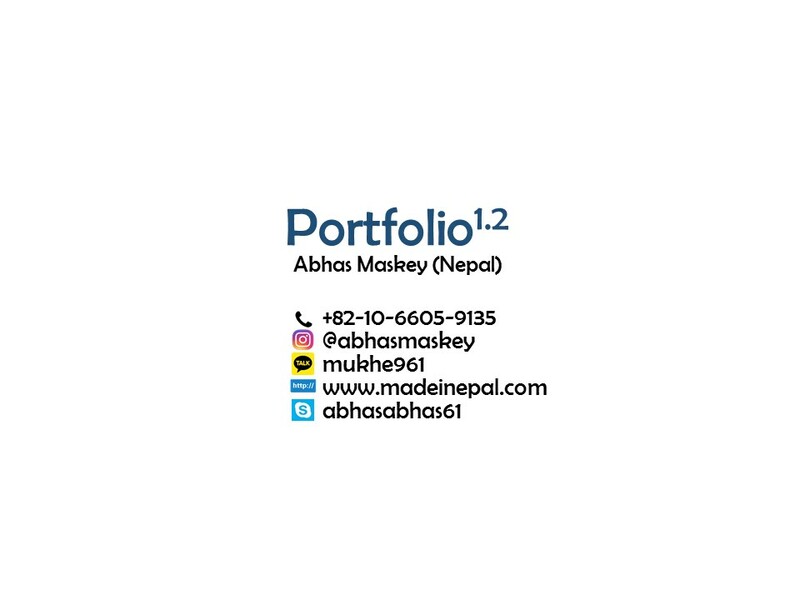 The presentation format is general and can be used in any job interviews, college admissions or while doing introductory presentations for myself. In case you're interested in the work that I have done and would like to collaborate in the future, here are those slides and their explanations. 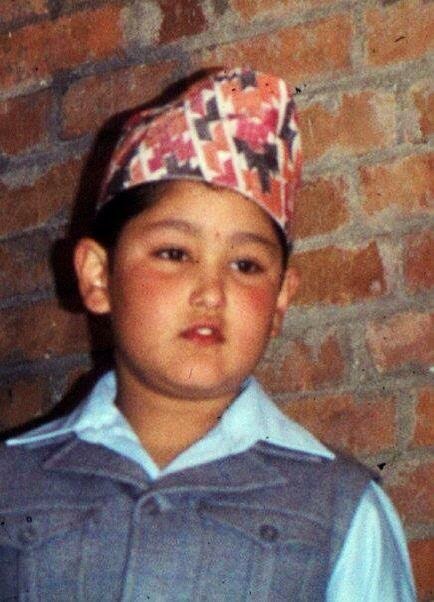 I studied at Budhanilkantha School in Nepal from 2000-2009 and did both my School Leaving Certificate and my GCE A-Levels (Maths, Further Maths, Physics, Chemistry, General Paper). After high school, I did my bachelors and masters at Seoul National University in South Korea. My bachelors is a dual degree on Mechanical and Aerospace while my masters in on Aerospace Engineering. During my final undergraduate year, I interned at Aerospace Propulsion and Combustion Laboratory under Prof. In-Sueck Jeung. 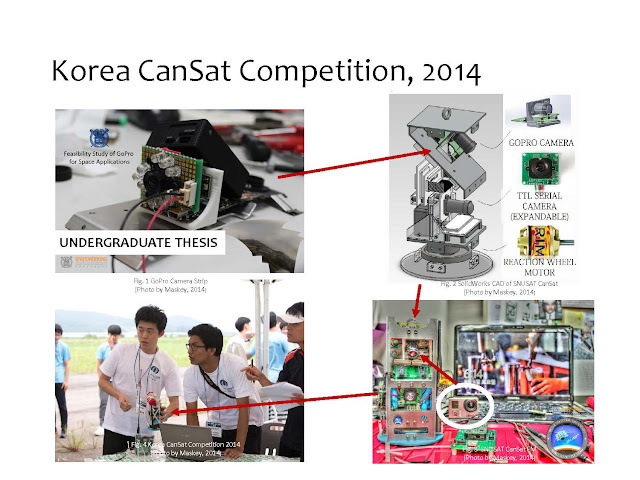 I wrote my undergraduate thesis on using Commercial Off-The-Shelf (COTS) cameras for satellite missions [HERE]. I continued my post-graduate degree in the same laboratory and was one of the founding team members of CubeSat Research Center (CRC) at Seoul National University (SNU). 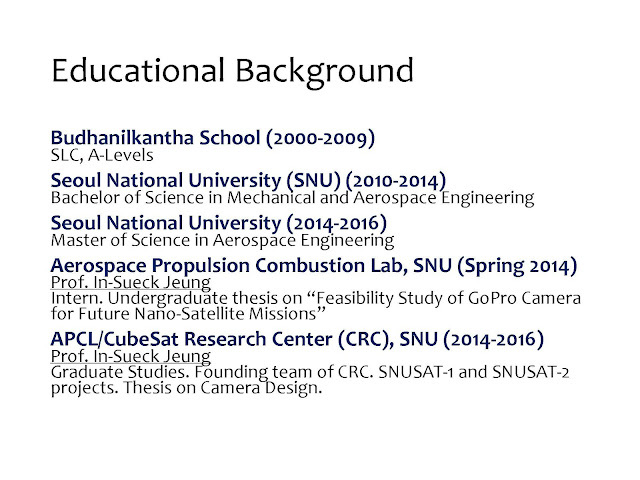 I had the chance to work on QB50's SNUSAT-1/1b program as well as the initial design of SNUSAT-2 satellite which was funded by Korea Aerospace Research Institute (KARI). My Masters thesis was based on the imaging payload of SNUSAT-1. Thesis is documented [HERE]. During my undergraduate studies, I received the opportunity to lead Seoul National University's CanSat team in the nation wide Korea CanSat Competition in 2014 [HERE]. The main reason for participating was that we wanted to check the functionality of the camera I was working on. That way, since the payload was defined, we could then proceed to create a mission. Because there were deadlines involved in the competition, I was able to learn about different sub-systems, setting requirements, budgeting, designing parachutes, ground station and launching in a very short span of time. That prepared me for a much tougher task of working on a CubeSat system. 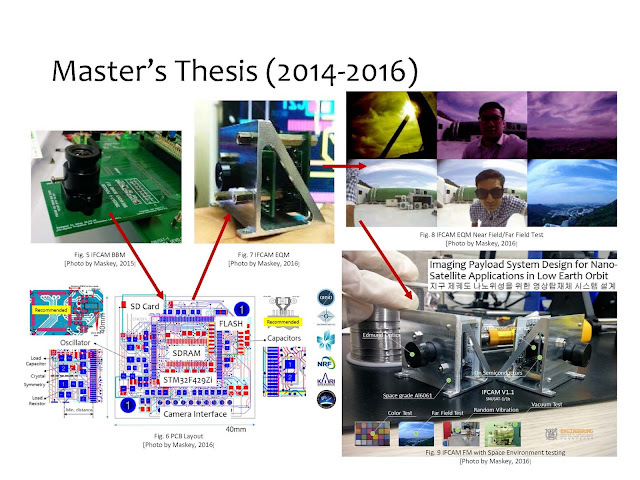 During my master's degree, my main research work was to build a camera from scratch and qualify it for space. I worked on two CMOS sensors from Korea (PixelPlus and ClairPixel) and one from US (OnSemi) and eventually settled for the sensor from On Semi because the documentation was much clearer. One thing to note is that CMOS is a common choice over CCD these days. The camera underwent color, far field, random vibration and vacuum testing. As a member of SNUSAT team, I also worked on the hardware of other subsystems including mission critical battery and on-board computer boards. Both these boards incorporated the design from the camera as I wanted to reduce the development time. Other boards that I designed were the InterFace Boards (I,II,III, GPS), EGSEs and prototyping boards. Although they were designed for SNUSAT-1/1b, they have also been used on SNUSAT-2's design. I have received two satellite related training; Kyushu Institute of Tech's Satellite Testing Tutorial and CanSat Leadership Training Program (CLTP) held at Hokkaido University. I believe that knowing is not enough and implementation is the key. 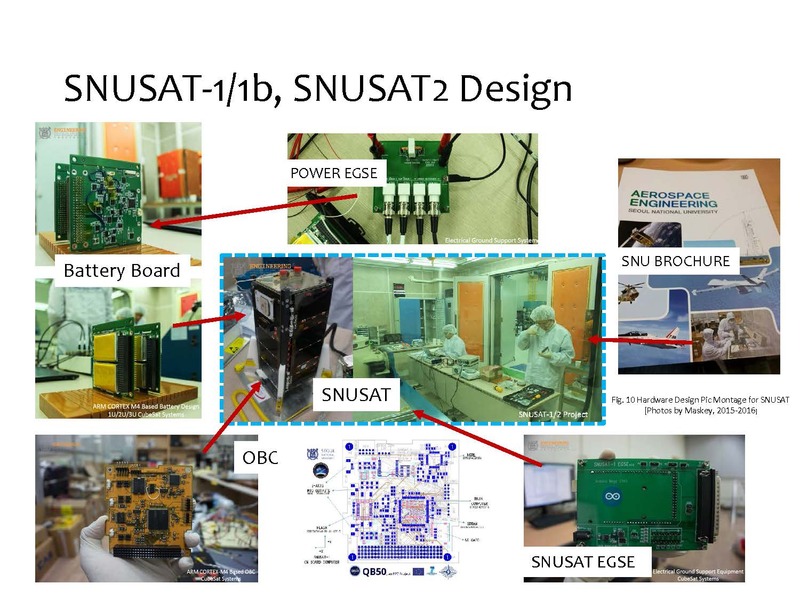 That is why after the training, I worked as the EQM test engineer for SNUSAT-1 system, EQM for battery and camera board and AIT of both SNUSAT-1 and 1b satellites. 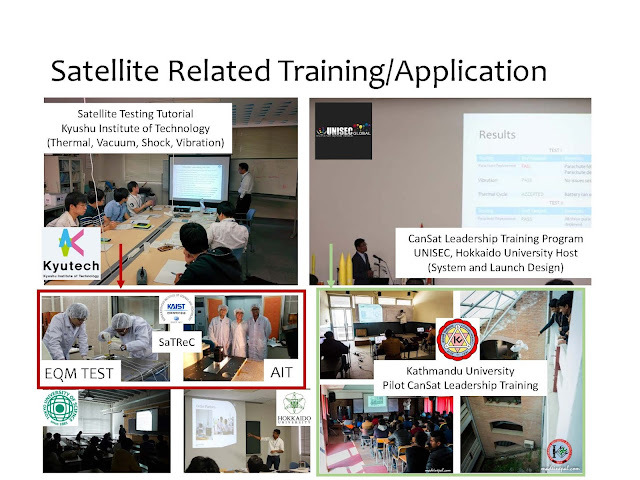 Furthermore, after the CLTP training, I developed a curriculum to teach CanSats at low cost and tested the concept on Kathmandu University's first CanSat Leadership Training Program. Three students from KU Robotics Team participated and the feedback was positive. In the next 10-20 years, technology such as Artificial Intelligence (AI), autonomous driving, drone technology, virtual reality, Internet of Things (IoT) and cloud based data analysis are going to be an integral part in how we move, see, eat and work on the space around us. 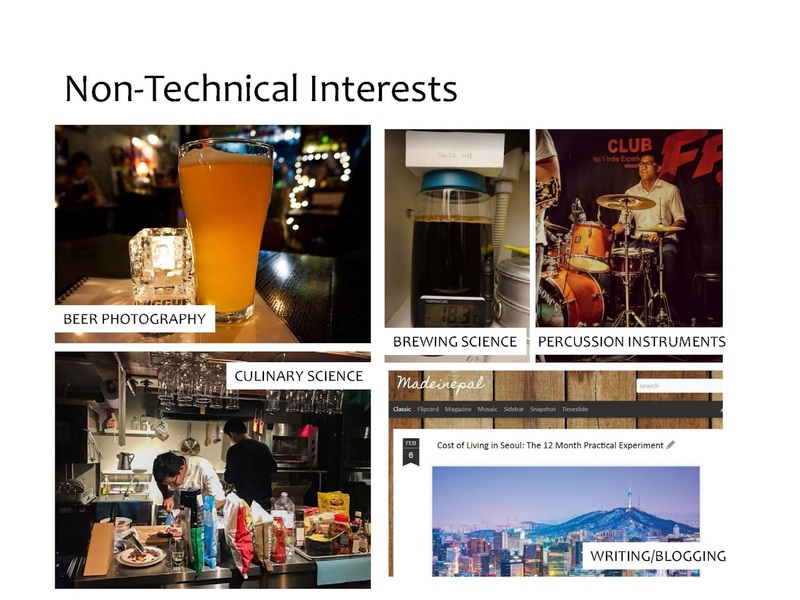 In fact, most of these tech are already part of our daily lives. A common trend you see is that these "new" tech are all emerging from startups rather than traditional, behemoth organizations. To be able to see the future and understand what it's going to look like, I strongly feel that the best way to take part in the future is to be part of a start-up and observe the scene from inside out. That is why, at the moment, I work for AngelSwing, a drone based cloud data company in South Korea. 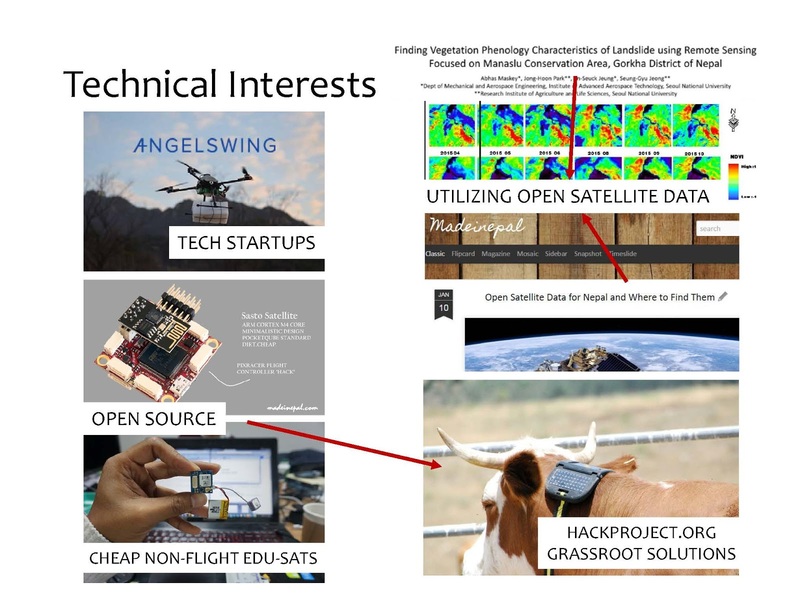 I am also interested in using open source to build cheap education related satellite systems, utilizing open satellite data in Nepal and participating in projects that are launched by hackproject.org. My idea is to recycle satellite system's base designs on solving grass root problems. To make sure that I always have a plan B in place, I am continually working to improve interests are that primarily not motivated by financial gains. These hobbies have allowed to meet and interact with people I never imagined before and made relations that have rewarded me a lot. No matter what I do though, I always make sure to document and document and document everything I do on the blog. That way, when I look back at a particular year, I can see a tangible growth in me. If not, there's no point in living.